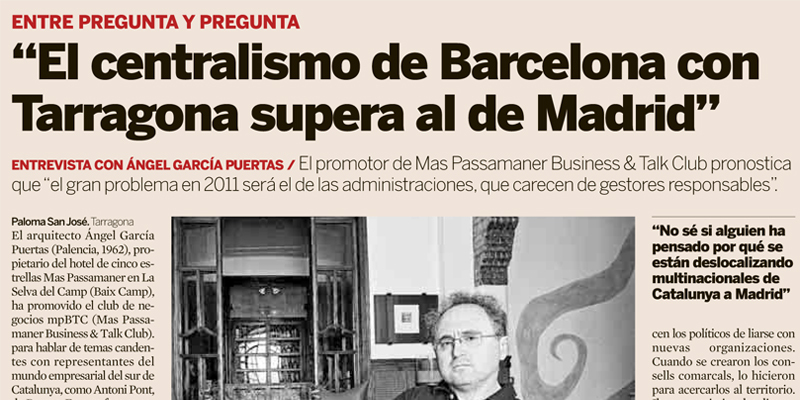 The architect Ángel García Puertas (Palencia, 1962), which owns five hotel estrellasMasPassamaner inthe Jungle Camp (Costa Dorada) has promoted the business club mpBTC (More PassamanerBusiness & Talk Club). to discuss hot topics with representatives of southern Catalonia mundoempresarial, comoAntoni Pont of Borges. The forum will hold lectures on “the future, hot and tricky” after which listeners and speakers will share tapasyconversación. Why has mounted a clubdenegociosenunaépocapocoboyante? Maybe that’s why. It is a time when everything is wrong. There is a collective depression that is perverse. All dificultadesdefinanciacióny pasamospor, cuantosmásproblemas, the more we get depressed and less are supported. Since laAdministraciónnohacenada, we must do something to make the sense in turning the wheel is the opposite of today. If compraraunpoco people, companies facturaríanmásylosbancostendrían more money. Banks are refusing to fund the government. The big problem in 2011 will be the government, lacking managers with responsibility. A municipality can stop pagaraunmontóndeproveedores and nothing happens. I think that creates wealth in a territoriosonlosempresarios. Aningún Noconozco union paid a salary to anyone. Politicians today are in a virtual world. The model of Spain in the queparaunapartedelasociedad no responsibility, it seems untenable. I mean politicians and sindicatos.Suamenazaesque Ángel García Puertas, Mas promoter Passamaner Bussines & Talk Club. The architect of ideas buzzing GarcíaPuertas palentinoÁngel politically incorrect. To find channels of expression to the clarity that muchosempresarios hide behind a facade of discretion negociosMasPassamaner club has created “an agora of the century”. This year has programadoconferencias about money, football, emerging countries, ophthalmology and dopaje.La club board includes AntoniPont business, shareholder of Borges; ArtemiTeixidó, optics delmismo name, the arquitectoUrbano Rifaterra, RobertMoragues, BMI, ManelSanromà of laURV, and the presidents of the four chambers of commerce in the regions deTarragona. A channel for political incorrectness will make a general strike, but I wonder what solutions are to someone. Paralosparados, ninguna.Las severance payments are the most damaging to trabajador.Hay to rethink many parts of the model. It depends on the politicians who have no guts to face them. Why do you think of the Government or the change in Catalonia? The tripartite was a dismal failure is evident. MesorprendecómoenCatalunya society and politicians do not realize that in recent years have not taken action against hechodequeelpuestoqueCatalunya has in Spain is being lost. We talk about competitiveness, image. I do not know if anyone has stopped to think why they are relocating CatalunyaafavordeMadrid multinationals. Every day I find someone who will. It brings me sadness and perplexity. There are no industrial relocations. I will not specify names, but people have two offices, two sitios.Alos inthe decision-making centers are not interested to stay, but not made public because it would unapérdidadeimagenenCatalunya. It is something that affects todoslos sectors. You have invested in Tarragona. What do you need this area to be competitive? Tarragona is one of the zonasmáscompetitivasquehay. The business is exemplary. There are very valid and enterprising people. Perhaps on the dependence of Barcelona.Sihayuncentralismo course, is much higher that of Barcelona and Tarragona that you may have regarding aBarcelona Madrid. It’s a real competitor in the industry. Girona and Lleida are agricultural and rural areas and are worried less. The Port of Tarragona is a competitor. Barcelona is a global brand … Tarragona esqueesmuydesconocida The problem is comounsatélitedeBarcelona yesonole benefits. Where should be the tourism sector? The sun and the beach are very good and demonize him is absurd. What happens is that nothing would happen to modernize the facilities, would enunamayorcalidad. What is your ideal hotel model? Hayque become obsolete hotels XXI century hotels. My model is the hotels of the senses and where you live experiences. How’s business? More Passamaner is in trouble, like everyone else. We wanted to enter into a price war, it would be impractical and a fraud for many customers. Each year we have chosen to invest in innovation. The business club is one of them. This year we have grown revenues by 25% over last year. We have invested seven million since the hotel opened. Not giving an inch on quality. We have adapted the restaurant, which have become a single table space with eight seats and tasting menu. We have also created a more informal area for quick business lunches and light. Interview with Angel Garcia Puertas, mpBTC promoter. More Passamaner Business & Talk Club.